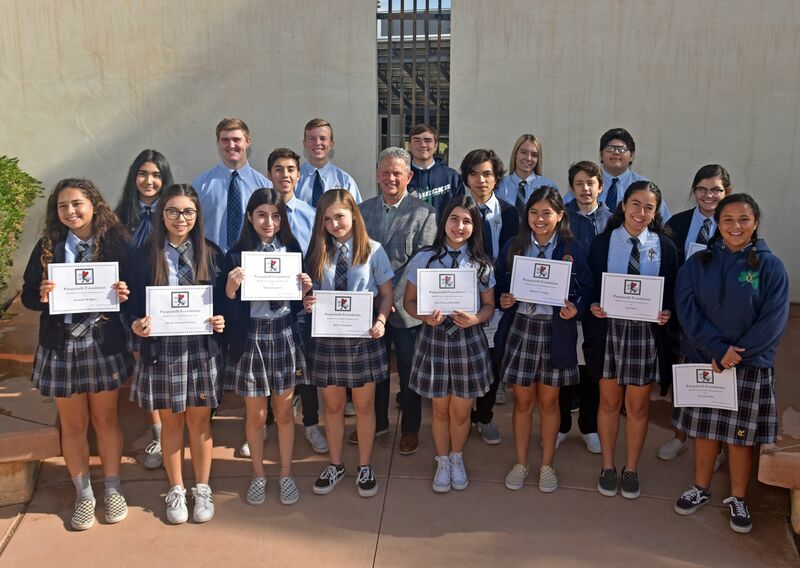 Yuma Catholic High School, in partnership with the Pasquinelli Foundation, announces that five (5) scholarships are available for incoming freshmen enrolling for the 2019-2020 school year. Based on the remarkable success of the 22 students currently receiving support, the Pasquinelli Foundation felt strongly that the opportunity should be offered again to incoming freshmen. Scholarships will be made available to students from the following schools: Immaculate Conception, St. Francis, Southwestern Christian, Yuma Lutheran and Yuma’s public/charter schools. Gary Pasquinelli, Foundation Chair, believes investing in Catholic education creates strong families, dedicated students and builds a lifelong foundation for service. Gary has made the following statement about offering more scholarships for the upcoming school year, “I am convinced, and the experience of our graduates has proven that a Yuma Catholic High School education will put a young man or woman on a direct path to high achievement in college and in life.” The Pasquinelli Foundation is helping sow the seeds for a future full of promise for these young people. Each of the five scholarships will fund $5,000 per year towards tuition for each of four years to attend Yuma Catholic High School. The support will be made available to those select students for all four years of their secondary education as long as they meet both the scholarship’s 3.25 minimum grade-point average and good conduct requirement. Information for the scholarships and applications can be found on the Yuma Catholic High School website: http://www.yumacatholic.org/admissions/scholarships.cfm or by calling Josie Smith, Finance Director, at 928-317-7914. The deadline to apply is Friday, May 19, 2019 at 4:00pm. “We are extremely grateful to the entire Pasquinelli family for their continued support and genuine interest in the success of the students of Yuma Catholic High School,” shared Bobbi Ukura, advancement director. Five of the Pasquinelli Scholars are graduating this year. We are excited to see what great things are accomplished by Alenia Esquivel, Jordan Grasis, Nicole Gutierrez Flores, Aidan Rodriguez and Isaac Torres as they move forward in life. Your extended YC family loves and is proud of you!